We just finished our brand-new Think Before You Pink® toolkit, full of resources to help you understand who’s really benefiting from all those ribbons, why breast cancer rates are increasing, and what you can do about it. We’re looking for 200 lead activists who Think Before They Pink—and want to do more. If you invest $10 today, as a thank you we’ll send you an advance copy of our information-packed Think Before You Pink® toolkit. Will you join us in changing the pink conversation? Be the first to use this information-packed toolkit to change the breast cancer conversation with your friends, family, and neighbors. Refocus their pink ribbon enthusiasm onto real change that will end this epidemic. Take action by making a contribution of $10 today and we’ll send you the tools you need to change the conversation about pink ribbon marketing. With a donation to BCA, you won’t have to question how much is actually going to the cause (all of it) or whether your purchase contains cancer-causing toxins (it doesn’t). Your courage, your support, your involvement, will change the conversation so that we can stem the tide of this epidemic–not by being more aware of the disease but by taking action, together, to pre-vent and treat it. Thank you for continuing to Think Before You Pink® with us. 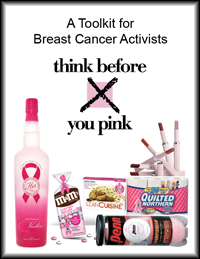 Click here to see a map of where activists are taking the Think Before You Pink® toolkit. 2 Responses to Who really benefits from all these pink ribbons? I would LOVE to spead the word on Think Before You Pink, but I am insulted that I have to pay $10 to get the information. Thanks for your feedback. We’re offering the toolkit now as a benefit to people who donate to help us continue to run our Think Before You Pink campaign. We are planning to make it available for all of our members in the future.